There is an still an ongoing debate on the mobility of artists and artistic productions. Within the European Union, both on national and international level there are several programs to support mobility. Only with the cultural program of the European Commission thousands of artists travel all around the world in each year. Local cultural venues have also international programs, we can reach foreign artistic products almost in all major cities. The numerous international organizations - who are active on cultural field - had improved a strong network among national organizations, which helps the implementation of cross-border initiatives. Although the financial crisis, combined with the less emphasized crisis regarding social values, has slowed down this process, there is a clear interest in these organizations to overcome the difficulties considering their international co-productions, as well as co-programing. From this point of view, the crisis had a positive effect on international mobility. It can easily happen- as in other sectors b the bbusiness as usualb approach will not appear again in the cultural sector. However, as creative industry, B we can turn the difficulties to our advantage! I believe that we have to think about it and try to find new alternatives regarding the mobility of artistic productions. . In general I will consider the second priority in this short presentation, but - as you will see - it can be the answer for the other aim, too. In Central-East Europe we are in a special situation, like e.g. in the Benelux states: Regarding Budapest, there are four other capitals which are available within four hours by cheap transportation. Meanwhile the new tendencies in aviation industry also transform entire Europe into a much more cross-connected area, where mobility becomes much cheaper. On the other hand, the reception of cultural products is influenced by the circumstances. We should also consider that the venue of performances or exhibitions have a great impact on the audience, too. The audience of international productions more often chooses by the venue than the production itself. Although the contemporary performing art is often presented in a bblack boxb all over the word, we cannot separate it from the atmosphere and image of the given institution. Just to clarify, if we present a classical performance in a venue, which is known as contemporary art, the audience will translate it rather as a modern critic. In the following paragraphs I will present two projects, which are (partly) dealing with the abovementioned btoolsb. . Although the trans-national mobility within the European Union reaches new peaks almost every year and citizens are traveling for several reasons, the cultural activities are not among them. We have to search for instruments to emphasize mobility of the audience among different regions. It means both organizing and funding their transportation to other countries. Audience mobility is already common at (pop)music festivals, but it is less developed in contemporary art. 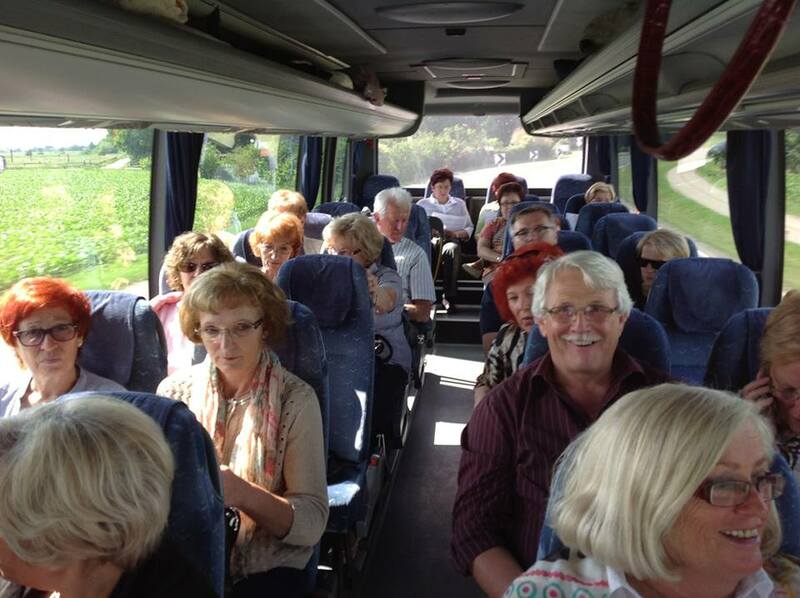 More audience: Audiencebs mobility may enlarge the audience of the venue. It is more significant in case of smaller audience. The networks among artists and cultural organizations are already well established. Might be the time has come to connect the audience also. Special performances: In case of contemporary art there are such productions, which are in the focus point only for a limited audience. Cost efficiency: Sometimes the travel costs might be lower than the mobility of the performance. In case of major sets, number of performers, the moving of the performance might be very expensive or if we cannot expect full house in other countries. Long term partnership among institutions. The principle of the co-work could be whether complementary or similarity. Self-organized groups, which can be supported by information sharing. Joined programs b e.g. sightseeing, gastro-tours, shopping (even if it looks far from culture). Tying also has additional opportunities as involving local businesses can be also a good financial source. B Subsidizing: By national, local or European support can also improve the mobility. Shorter trips: International mobility could be interesting in regions with smaller distance among countries or cities which are close to the borders. As we already mentioned, in the CEE region it has more potential. Additional days: Although costs might be higher, in some cases it can worth to spend a few more nights within the frame of the program. Especially in case of festivals. Group dynamic: The structure of the group is a key. It can make the trip itself also more interesting. Non-speaking programs: Most of the cultural programs does notB requires any langue, e.g. exhibitions, dance performances etc. We can help the audience by sharing translated information about theproject forehand. Knowledge: We can always find audience with the required knowledge and there are also multi-language theatre companies. 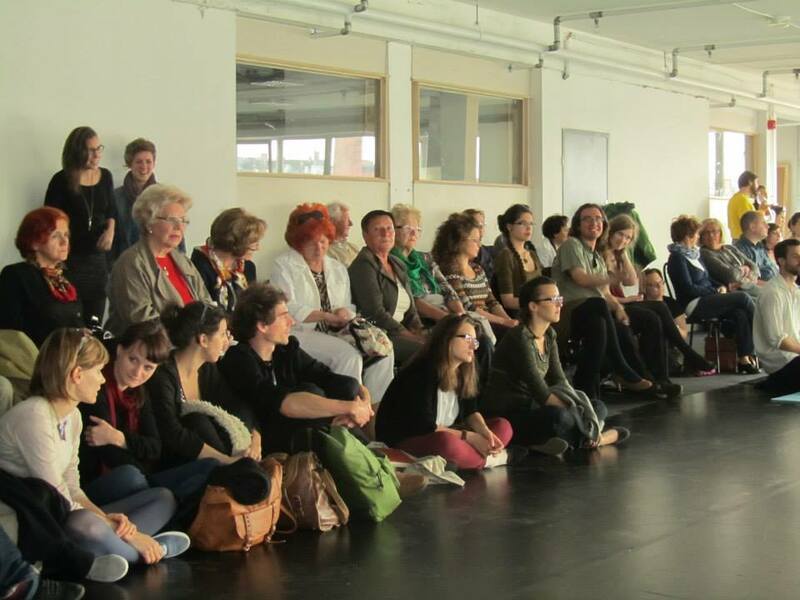 Pro Progressione with its partner organizes audience mobility actions since 2008.
International audience at a contemporary dance program in the framework of Beyond Fornt@ project . We have also added other elements to the core idea, e.g. small actions during the trips (e.g. amateur dance performances at gas stations, presented by the audience). . Although it is hard to imagine a mobile venue b usually they require a building, which is obviously not mobile - but with a more flexible approach, a venue can be mobile in different ways: . rolling/flying/floating venues are also possible with some restrictions. Now, we will review the last one, a venue which moves physically from city to city. Unique, more interesting: The main advantage of a mobile venue is its novelty. Although there were several programs e.g. art ships, none of them were able to define themselves as a venue which is operating in a long term. They were established for one project, which approach we should overcome sooner or later. A unique interpretation can reach a larger audience. Real international co-production: Although there are several international productions, most of them cannot reach the goal to be connected to one specific country. The place of the creation, the premier always determines the bnationalityb of the cultural product. With a moving venue (so as for creation as for presenting) it can be improved. Perception-free performance: The venues have their own image, which influences the reception of the audience. A specific venue has less intellectual distortion on the performances, and can become the part of the performance itself. International productions: The venue can integrate international productions. Since the place of the creation is not linked directly to any country, the performances should also cross the borders. Sponsoring: Since the events are unique it can be interesting for sponsors. Generated incomes: The venue itself can be used for other purposes (e.g. conferences, meetings) also, which can generate an additional income. Site-specific performance: The performances should be created whether exclusively for the venue or modified according to the given circumstances. 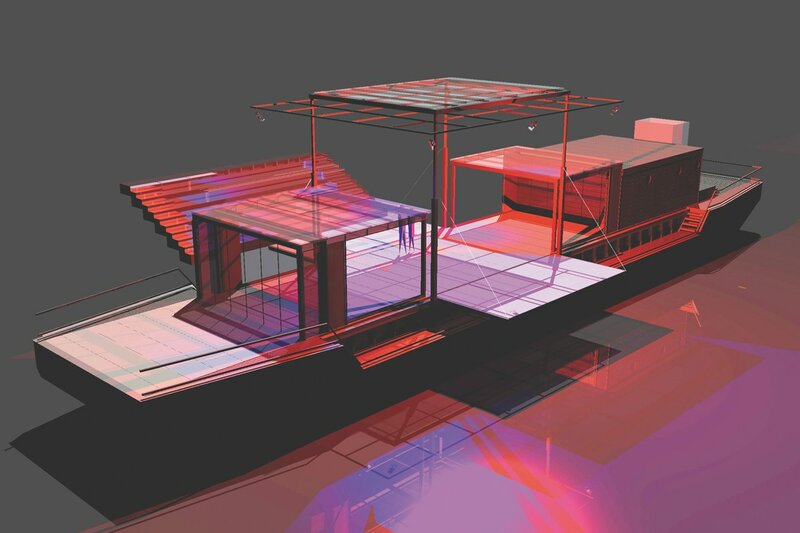 The new project of eight civil and cultural organizations, called "RIVE" had chosen a ship to become a cultural venue. The plan is, supported by the European Commission also to establish a cultural entity which is travelling along the most important river of Europe, the Danube in 2014. .
We have linked the program to the river, as other venues are linked to cities. The theme of our program is directly linked to the Danube. With this idea, our aim is to establish a cultural entity, which has a unique cultural identity. The program will consists not only of several countries but also of interdisciplinary programs. We work with video, performing, fine arts and music to create a unique performance, involving special potential of the vessel and the river. . The main aim of the current publication was to re-think the mobility in culture. We have inversely approached the most common systems, as we described also the opportunities of mobility at the other side of the bcultural supply-chainb. We examined the mobility of audience and venues and we have summarized also some benefits of these actions, likewise the possible risks and difficulties. The main aim of these programs is to share art products and to minimalize the impact of local circumstances on the perception of the visitors. We strongly believe in the potential of such programs, because they can make the current cultural life more diversified and to ensure that the output will be more accessible. But we find it very important to emphasize that any of these solutions will never replace the mobility of artists. They are more likely filling a gap, to offer a broader cover for our audience. Only a good mixture of different mobility programs can be acceptable, where networks (from artists to audience) are established among all participants. In the future we will continue the testing of these actions and we would like to go further to push their present limits. We believe that these programs should be accepted as complete and full mobility actions and they have to be considered in cultural policy making. .
Barna Petrányi.B Born in 1983 in Hungary. He studied finances at the Corvinus University in Budapest. After working at different cultural institutions, including profit-oriented festival organizers and an independent contemporary dance company, he founded Pro Progressione in 2008. The non-profit organization coordinates several international programs and cooperation on the field of contemporary performing arts. .
 More then 50% of visitors at Sziget Festival (www.sziget.hu/festival) are comming from abroad for more then a decade. It means over 30.000 people a year since 2005 for the one week program. The short description of the program is available: http://pro-cult.com/?page_id=92, from 2013 September under www.cultship.org we will have a dedicated website.